Zone·tv™ is introducing a revolutionary, feature-rich suite of powerful video services under the zone·tv Studio brand, that enable completely new ways to engage and empower viewers through next-gen TV experiences. With zone·tv Studio content owners and video distributors (e.g. MVPDs, vMVPDs, traditional networks and new over-the-top networks) can now create self-branded, linear TV channels that can be personalized and customized by and for each viewer in the household for the first time, shattering the limitations and norms of the traditional model of linear pay-TV. Zone·tv Studio is an artificial intelligence-powered service for content discovery, channel curation and video delivery. Using proprietary intelligent software built by zone·tv, video distributors and content owners can now deliver a “Spotify-like” experience, which for the first time is not based on what a programmer wants to show the viewer, but instead based on what the individual viewer wants to see. The robust tools seamlessly create intelligent, personally curated, automated and highly engaging thematic linear channels that help subscribers discover content that appeals to their own sensibilities. Zone·tv Programming Studio is designed for authoring a channel, which can be done by humans, automated by the zone·tv A.I. Studio or both. Zone·tv A.I. Studio assesses the channel content, enhances the asset metadata via video indexing, classifies it and incorporates additional, relevant, trending information using zone·tv’s own signal networks. All channel content is stored in the cloud and seamlessly interconnected with similarly themed channel content built upon a sophisticated Machine Learning curation algorithm. By leveraging the close integration of zone·tv’s Programming Studio and A.I. Studio, content curators and the Machine Learning algorithm can best predict viewers’ preferred programming and easily curate services accordingly. Zone·tv Ad Studio allows for the management of advertising in channels and is designed to integrate with ad tech partner services for ad decisioning and ad insertion, all fed by rich metadata and content parameters that only Studio can provide. Zone·tv Ad Studio provides the most relevant advertising that becomes a part of the programming story for each channel. Zone·tv Configuration Studio enables rapid delivery of the partner’s content service to any end-point device or system. 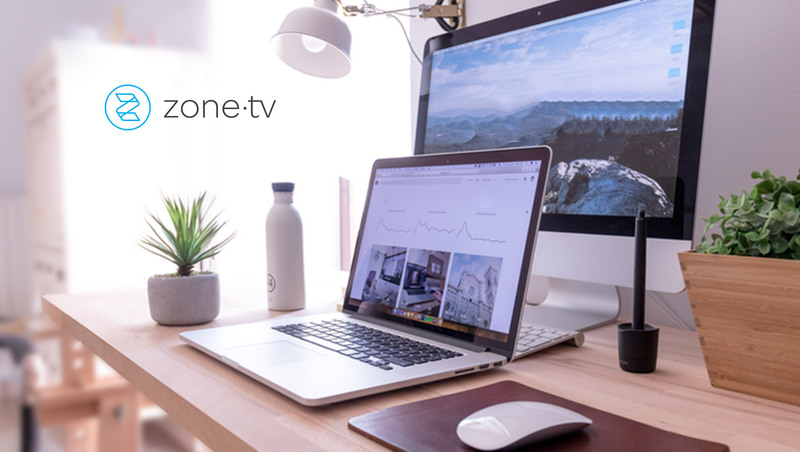 Examples of how the zone·tv Studio works can be seen in zone·tv’s proprietary Dynamic Channels and On Demand channels, available on a wide array of pay-tv set-top boxes, bring-your-own-device (BYOD) services and smart TVs. These Dynamic and On Demand channels leverage every component of Studio to deliver beautifully curated content that is personalized and predictive for the ultimate viewing experience. The zone·tv Studio learns what viewers love to watch and presents similar content, automatically and in real time. This unique capability empowers viewers to create their own channels with the click of the TV remote control and “zone·ify” their own channel. The result? Each viewer’s channel is personalized just for them. The zone·tv Foodies channel you are watching could be focused more on grilling while your neighbor’s Foodie channel could deliver more about desserts, and all the viewers had to do was watch the shows they love. Because the service is entirely cloud-based, video distributors and content owners can quickly onboard their existing libraries of exclusive or licensed content, enhance the metadata, curate, program and deliver an A.I.-enhanced video service without the need for any special equipment. “We are giving our partners an edge not only through superior tools and algorithms, but also by breaking through the psychology of doing things the way they have been done in the past – which makes the traditional video distribution industry vulnerable. It’s a very exciting time and we believe it’s our time, too,” added Weber.